Nokia launched the Nokia 7 Plus at MWC 2018 back near the end of February. It was unveiled alongside the Android Go packing budget Nokia 1, a revamped Nokia 6, the Nokia 8 Sirocco, and the Nokia 8110 'banana phone'. For many, the Nokia 7 Plus will be the 'Goldilocks' device with enough high-end style attractions to appeal, without the high-end pricing to overwhelm their purchasing desires. The Nokia 7 Plus does indeed look nicely crafted; its build is dominated by a handsome 6-inch FHD+ IPS screen (2160 x 1080) with minimal bezels, and the black, or white, base colour with ceramic feel aluminium unibody and subtle diamond cut copper edge highlights look rather high end. Inside, this smartphone doesn't boast the highest end components but they are still competent. For example, the Nokia 7 Plus is powered by the Qualcomm Snapdragon 660 rather than an 800 series SoC. It has a dual rear camera setup with Zeiss optics (normal and 2x zoom) but they would ideally feature OIS. As mentioned above, this smartphone sports an IPS panel but an OLED one would be preferable. Furthermore, this smartphone comes with 4GB of RAM which is often exceeded by flagships nowadays. 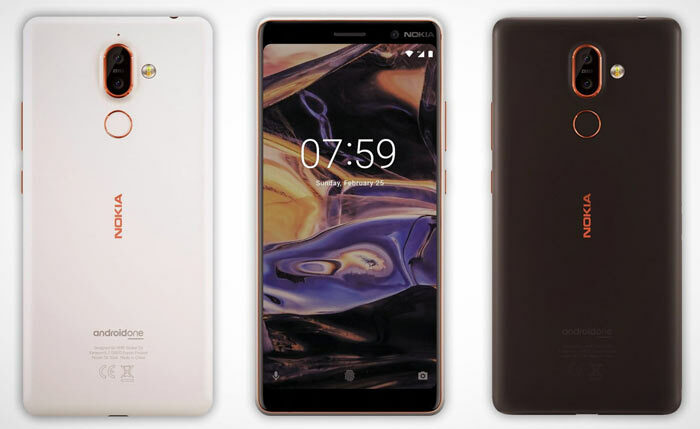 If all the above concessions made to bring this smartphone down to the mid-range are acceptable, you will likely be pleased with the Nokia 7 Plus minimum of 64GB storage (with microSD expandability), the Zeiss optics on the 16MP selfie camera, Nokia special audio recording (3 mic OZO Audio), and the fact that this is an Android One device (shipping with Oreo). With Android One you get the stock Google Android experience and the promise of speedy updates for features and security. 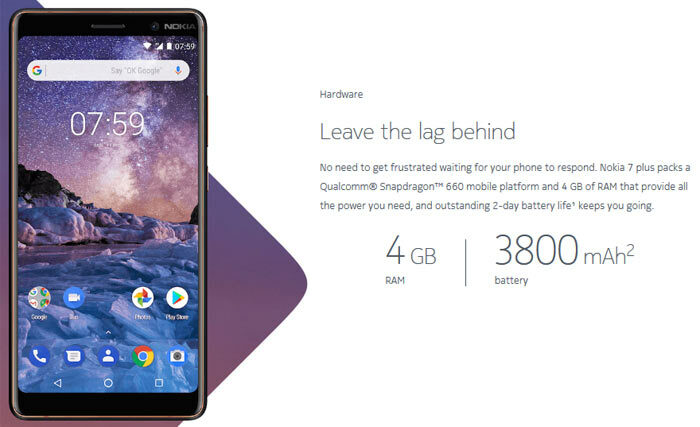 Another benefit of Android One is said to be its lower demands on the hardware compared to various third party skinned alternatives, so this Snapdragon 660 device with 4GB of RAM might feel fleeter of foot than you would otherwise expect, and provide better battery life too. Other features worth highlighting are support for; LTE Cat 6, Wi-Fi 802.11 a/b/g/n/ac, Bluetooth 5.0, 3.5mm audio jack, single speaker, Corning Gorilla Glass 3 protection, USB Type-C connector, 3800mAh battery, single speaker. The Nokia 7 Plus measures 158.38 x 75.64 x 7.99 mm (with camera bump adding 1.56mm) and will be made available in Black / Copper, White / Copper. Pre-order price in Europe is €399, and here in the UK it is £349. For the first month here in the UK, a Google Home Mini will be offered in selected retailers as a redemption offer. I found it for pre-order on Amazon UK today but there is no mention of the free Google Home Mini on the page, so it might be worth waiting for the description to update or check other retailers. In Nokia's email to HEXUS it says the Google Home Mini offer runs from 2nd May 2018 for one calendar month, via select retailers. It's using the 660 (assuming nothing is incorrect or changed)… which is Octa-core (4x2.2 GHz Kryo 260 & 4x1.8 GHz Kryo 260) which is according to wiki a combination of four semi-custom Cortex-A73 cores (the performance cluster) and four semi-custom Cortex-A53 cores (the efficiency cluster) in a big.LITTLE arrangement. I've got the Xiaomi Mi A1 with the Snapdragon 625 (A53) and I have to say it feels perfectly fast on Oreo (Android One device). It definitely feels faster than my Nexus 6P which it replaced around the OS, and while the Nexus 6P is 2 years old, it's still a zippy performer (only reason I upgraded was because the battery was shot). Short of benchmarking I think you'd be hard pressed to tell this apart from any flagship, though I guess certain camera features are missing or take a touch longer to calculate. I regret buying the Mi A1 purely on the basis that I wished I'd waited for this. It's perfectly capable, but the Nokia 7 is just calling out to me. 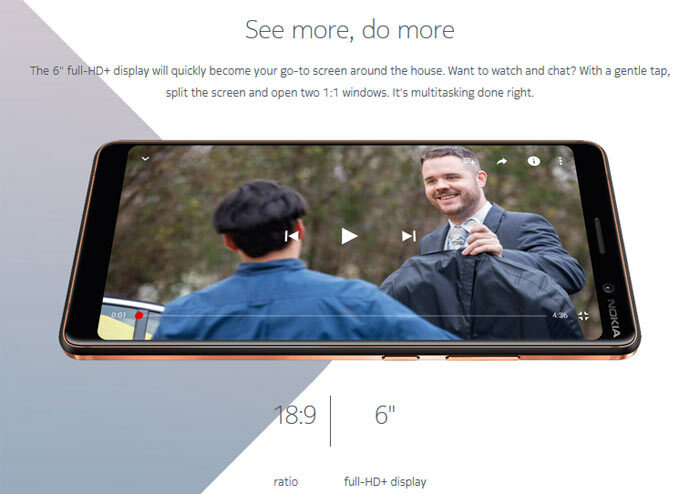 Today, HMD Global announces the UK sales start of the Nokia 7 plus. Offered in Black/Copper colour option, it will be available for purchase on 2nd May from EE, Carphone Warehouse, Amazon, John Lewis, Tesco and Argos for a RRP £349.99. The A1 is a much cheaper device though - it's under £200 and the A2 is out soon too.